FX 3D-moving-picture jigsaws are fascinating puzzles ! Extra concentration is needed to complete these puzzles, and the finished pictures have a fascinating appeal. 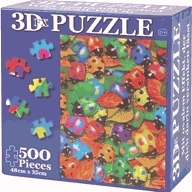 Two vibrantly-coloured designs are available - Ladybirds or Butterflies - for these 500-piece FX 3D moving-picture jigsaws. If you love unusual jigsaws, you will love our FX puzzles ! And if not, someone would certainly love one as a gift from you !? 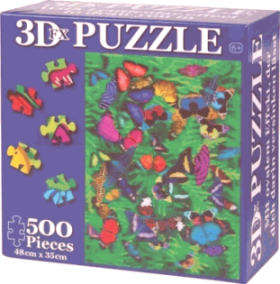 Our FX 3D-moving-picture jigsaw is only £11.99, click to BUY now !! Normally despatched within 24 hours, and certainly within 3 business days. 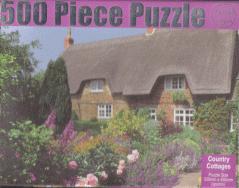 OR see our cheaper 500-piece Jigsaws, Country Cottages, Pond Kids, Beach Children, Puzzle Children or Lovely Flowers. Do visit our Online Store to buy these lovely jigsaw puzzels - FX 3D-moving-picture or other jigsaws ! "These I did enjoy doing, and I framed them." "A pleasure, and my 10 year old son enjoyed helping ! " Colin Wilmot, 166 Freeman Street, Grimsby, N.E.Lincs, DN32 7AT. © Wilmots, 2019 - taking care with your privacy, see Wilmots HOME.